A smart move or a self-sacrificing act of stupidity? It’s odd that exacting number lovers like the Germans have a tendency to lie about the performance numbers of the cars they build. Look towards the AMG, M, and Audi Sport divisions and you’ll see multiple examples of cars with horsepower ratings far off from what the dyno claims. Except instead of making their cars sound better than they really are, German automakers skew the opposite direction by sandbagging. Audi Sport head of technical development Stephan Reil just openly admitted that to Car Advice. Speaking to the Australian motoring outlet about the new 2018 RS5, Reil mentioned that actual 0-62 mph times are expected to be lower than Audi’s claimed time of 3.9 seconds. “I’ve been in this job for nearly 20 years, and with all the cars I’ve worked on, the performance numbers we published were conservative. And it’s no different with the latest RS5,” said Reil. “So, if we say 3.9 seconds, you will measure, maybe, 3.7 if the conditions are fine, probably 3.8, but even under the worst conditions, you’ll do it in 3.9 seconds. But you will not find a 4.0.” That’s actually a good thing for drivers, but it could hurt Audi’s sales even if the effect is slight. So why do Audi and its German competitors undergo this practice? Reil claims the only way we’ll see an improvement on that end is with new tech. “What we have done with the new RS5 is the best we can do right at this time, but of course technology gets old quickly, so we will be able to do better once new systems arrive, such as 48 Volt systems, which we will be able to fit into cars like this one – otherwise it’s more suited to SUVs like our SQ7 at the moment,” added Reil. The 48 Volt electrical system would make it easier for automakers to utilize electronically spooled turbochargers to better do away with lag. 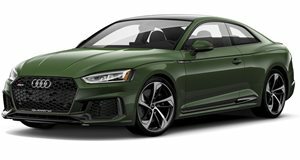 “For now, like with the RS5, we have placed the turbos inside the hot vee of the engine, and that reduces the pipework and increases gas flow and throttle response; therefore, minimal lag,” said Reil. Mercedes uses the same tactic with a high degree of success, so as long as the RS5 works as advertised or better, we’ll go along without complaint.